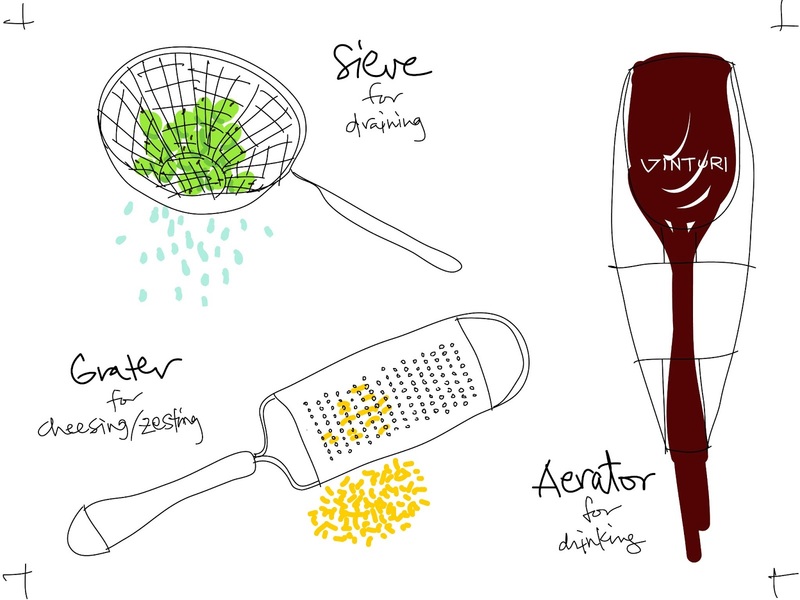 This week, we're sharing some tools we have been using in the kitchen which have made our lives a lot happier and tastier. Vinturi Aerator - I never expected this day to come but I can definitely taste the difference between wine that is flat and wine that has been allowed to breathe. I'm far from being a sommelier but over time and through travel I've probably tasted hundreds of wines and the common denominator for better tasting wine has been aeration, either via a decanter, rapid twirling of the wine glass, or through an aerator. I really believe it enhances the wine drinking experience, bringing out the bottled up aromas and flavors. Sieve - Over Easter I made Lemon Curd Tarts. The recipe called for eggs and warned not to overcook them to avoid curdling. Well I did overcook the eggs, resulting in clumps of curdled egg whites in the lemon mixture. Thankfully I had a sieve which allowed me to separate the egg chunks from the smooth lemon curd, essentially saving Easter from disaster. The sieve is very versatile and I have it in different sizes which I use for washing fruit and making tea. Grater - It's not a secret that shredded cheese is almost always more expensive than the same block of cheese sold by weight. I don't mind taking a little bit of extra time to shred my own cheese if it means saving a few bucks and the environment from another plastic bag. Plus I think freshly shredded cheese tastes better too. I also use my grater to zest lemons for cocktails, desserts, and tea. Tong Tong Tong Tong Tong. Let me see that toooong - Similar to this. I am bad at using chopsticks, and I can't deny it. I hold them wrong, and I always drop things with them. I have been using tongs for flipping steaks, cooking noodles, etc. and they have been a huge help for my clumsy hands. I bought all steel ones though, and I would recommend getting some sort of plastic to help with the grip. I didn't because I thought it wouldn't be a genius idea to stick plastic into high heat and poison myself slowly... but sometimes the food slips and then I curse myself. Le Creuset Chef's Oven - I received my Le Creuset as a wedding gift, and I am in LOVE with it. I never really thought cooking was FUN, but the Le Creuset makes cooking enjoyable. You can use it on the stove, or in the oven. In my opinion, it's even more versatile than a dutch oven (and half the price). I really enjoy using it because I can make a wide range of foods like pulled pork, pulled chicken, just pulled deliciousness. Lightweight Bamboo Cutting Board - Similar to this. I suggest hitting up TJ Maxx Homegoods because they always have a ton. I used to have a thick wooden cutting board, but it seriously hurt my wrist to lug it around and I always had to use two hands. I finally bought one after a few weeks of BDF's nagging advice, and I have to say it was the best purchase for the kitchen! It's light and easy to grab and use. It's definitely an everyday essential that makes the biggest difference in my kitchen life.